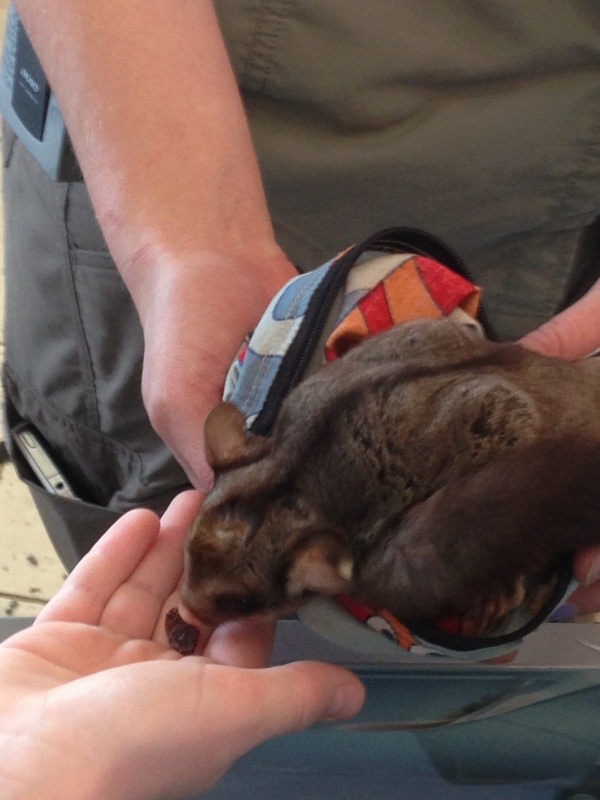 Today, I want to write about sugar gliders because I have held them in real life and they are very cute. They are the smallest of a group of possums called the Petaurus gliders. They are only 21 cm long plus a tail that is the same length and they only weigh up to 170 grams. I have held one in my hands and they are very light. They have skin between their ankles and wrists that enable them to glide up to 50 metres between trees. Sugar gliders are nocturnal and come out to eat sap and gum from trees, using their very sharp teeth to bite into trees. They also eat flowers, nectar and insects occasionally. Like other marsupials, their young is raised in the mother’s pouch, not coming out until they are about 60-70 days old. After they leave the pouch, they the babies will ride on their mother’s back. Sugar gliders are very common and are found in forests throughout Australia, Papua New Guinea and Indonesia. They are also a popular pet in the United States, where some people think that they eat sugar which makes them very sick. Are there any interesting facts that you would like to share about sugar gliders? I never knew about Sugar Gliders before, that was very interesting!